« It’s Not a Violin, Dammit! A highly stylized four-leaf clover comprised of alto clefs is the perfect viola player’s attire for St Patrick’s Day or year-round, whether he or she is very Irish or not! It also makes a distinctive design appropriate for ‘viola fiddlers’ and Celtic music players! 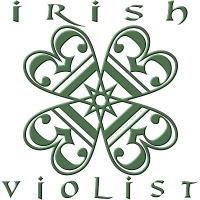 Purchase the cute “Irish Violist” design now on a t-shirt, hoodie, mug, or various other apparel and giftware items for your favorite violist, exclusively from Bratsche’s Viola Bazaar!